These are Steve Ryland's cycle wing brackets, made from stainless plate & bar bent in a vice by hand, until just how he wanted them. There are small flat plates on the inside of the wing welded to the bars, and theen a pad of polythene foam between the plates & wing. 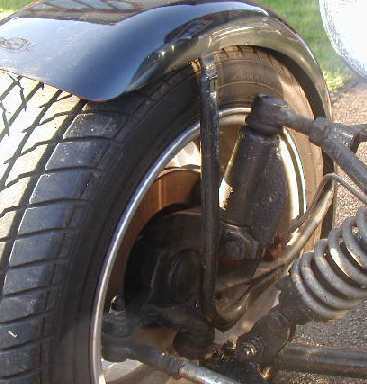 These are the MK brackets, you'll note that the bracket comes very close to the caliper, and on this modified slidding pillar car, it has been "adjusted" to miss the coil-over on lock.